The only noticeable alterations were to the pumping mechanism and to the swell box. A pumping handle was provided on the treble side, using one of the two feeder bellows, no doubt because use of the pumping pedal is restricted by the pedal keys. The pedal keys were originally retractable but the damage to the key action means that it is now fixed. There is no electric blower. The swell box was covered with thin boarding presumably by Whiteleys of Chester in the late 1940s (indicated by a note in blue crayon on the slats), which was removed in 2016 during the first complete restoration in the organ’s history. The work was carried out by Dominic Gwynn, Nick Hagen, Joseph Marsden and Stuart Dobbs, between November 2015 and May 2016. Bevingtons were known for making small model organs. They were fairly conservative in their voicing style, though the stop list, mechanism and appearance were up-to-date. 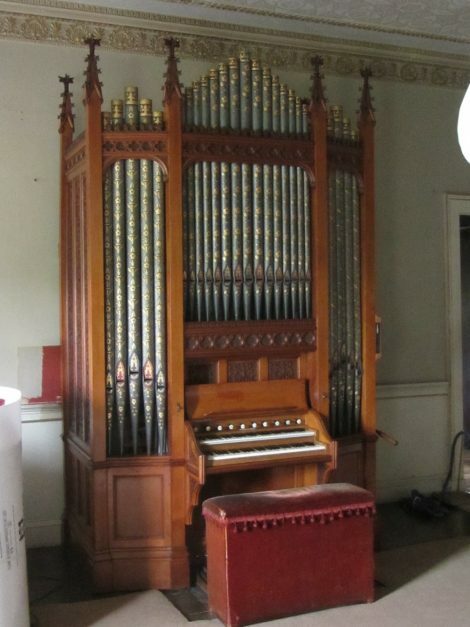 It is designed as a miniature church organ rather than a Georgian chamber organ. As a result access for adjustment and maintenance is very restricted, and dismantling and re-assembly was challenging.